In this blog post we compare prices & discounting policies for Backupify, Spanning and other G Suite backup solutions. In addition to published list prices, we will review backup vendors' discounting practices based on customer and partner feedback we collected. If you want to know more about the products and see a detailed review of their features, check our review of best G Suite backup solutions . Afi.ai develops G Suite Backup platform, and as part of our competitive analysis we continuously monitor prices for top G Suite backup vendors. Below we present the results of the price comparison which is based on customer & partner interviews, collected & summarized by our product marketing team. Most cloud-to-cloud backup software vendors publish their list prices (also known as MSRPs or undiscounted prices), with Backupify being the only major player that doesn't disclose prices on the website. Based on our analysis Backupify prices its G Suite backup at $3 per user per month, in line with most of its competitors. Spanning and Syscloud price their services at $4 per user per month, which makes them the most expensive G Suite backup solutions. As you can see on the graph below, the list prices for most vendors differ significantly from actual selling prices - those that account for discounts and other special terms. If one would compare Backupify vs Spanning G Suite backup solely based on their list prices, one would incorrectly conclude that Spanning's solution is 33% more expensive compared to Backupify ($4 vs $3 per user per month). But the actual difference in pricing is approximately 20%, if effective selling prices (after discounts) are considered. Major factor behind the discounting is company and deployment size. We discuss other major factors that influence selling prices in the next section. All prices are per seat per month, based on annual contracts. List prices are based on information published by vendors and resellers, effective prices are estimated based on interviews with resellers and end-customers. We believe that Backupify provides one of the lowest price levels (after discounts) - approx. $2.5 per G Suite seat per month for organizations with >1000 headcount and $2.8 for customers with >100 employees. SysCloud and Spanning have higher list prices ($4 per G Suite seat), and they provide slightly deeper discounts for largest customers - approx. 18% ($3.3) and 25% ($3.0) for >100 and >1,000 HC customers respectively, which still leaves their effective prices higher than Backupify. On average, medium organizations with >100 seats can achieve 7-13% discount from list prices, with cheapest discounted price provided by Backupify. Large customers with 1,000s of employees can achieve as high as 25% discounts off the list prices. Larger deals are more likely to involve deeper discounts. Backup vendors routinely provide >5% discounts for deals above $5,000 in annual contract value. Large organizations (>1,000 headcount) more often receive discounts, as part of vendors' "land and expand" sales strategy. In our experience customers are more likely to receive discounts related to organization size in Backupify vs Spanning and other vendors. Backup vendors more willingly discount prices on their premium products and bundles (such as G Suite backup + DLP, G Suite Backup + security) compared to basic editions of G Suite backup products. Vendors often provide special pricing for Education and Non-profit organizations, mirroring Google's policy of subsidizing G Suite for these industries. Typical discounts for these industries range within 20-30% in addition to other discounts. In addition to volume discounts, cloud backup vendors offer multiple editions of their backup products, offering advanced features as part of more expensive options. For example, SysCloud includes Data Leak prevention in its second tier, which is $2 /month is more expensive than its basic plan priced at $4 /month. Premium edition differentiated by compliance features, volume discounts start with 100 users. Large customers with 1,000s of users often purchase a combination of G Suite package options, e.g. 500 G Suite Enterprise SKUs and 500 G Suite Business SKUs are merged to produce a custom package to satisfy their needs. 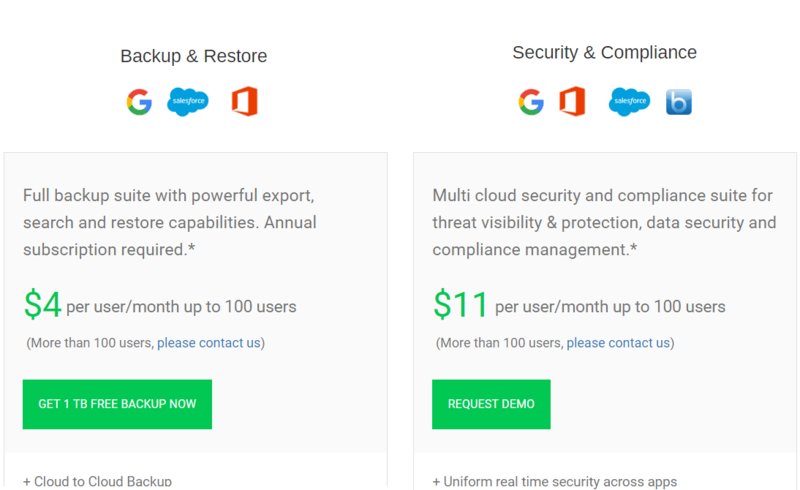 Backupify and other G Suite backup solution providers customize pricing to accommodate the large client's requests in a similar way. They often apply licensing mixing tactics when negotiating large backup deals. In one case a client with manufacturing environment composed of "deskless" workers was able to achieve 40% discount for G Suite backup licenses, as the backup vendor acknowledged their limited data usage and protection requirements. If you are able to demonstrate that a significant part of your G Suite accounts has consistently low usage, you are likely to be able to negotiate additional discount. Lower G Suite data usage means lower support and infrastructure costs for backup vendors, and they would typically pass some of the savings to the customers. What are the best G Suite backup solutions?